Rising in the mid-13th century, Sukhothai laid down much of the cultural and political groundwork for the kingdom that eventually became known as Thailand. Towering monuments with exquisite details and well-documented records now make the ancient Thai capital a premier heritage destination. Even if the history doesn’t interest you, Sukhothai’s ruins do not fail to impress. Featuring 193 ancient sites spread out amid trees, ponds, paddies and villages in several different zones, Sukhothai Historical Park opened in 1988 and received UNESCO world heritage status three years later. Many travellers hit only the big-name attractions, including Wat Mahathat and Wat Si Chum, but we suggest wandering through some of the more remote ruins as well. While a couple of days in Sukhothai will be enough for most, you might also take side trips to less-touristy ruins found at the former satellite cities of Si Satchanalai and Kamphaeng Phet, both of which share the same UNESCO status as Sukhothai. Throw in Sai Rung Waterfall and perhaps some mountaintop camping in Ramkamhaeng National Park and you could easily lose a week in the area. Located 12 kilometres east of the historical park along the Yom River, Muang Mai, or “New Sukhothai,” is the small capital city of modern Sukhothai province. Excellent-value accommodation is found in Muang Mai and Muang Gao, the much smaller “Old City” stretching east from the historical park. Both areas host a well dug-in traveller scene. Sukhothai is one of Thailand’s most popular venues for the Loy Krathong Festival held annually on a full moon in November, when the historical park hosts lightshows, folk performances and candlelit offerings sent floating on the ponds. On the first Friday evening of each month, a smaller light and sound show is held for free alongside a market near Wat Sa Si. Sukhothai’s location in Thailand’s lower north (or upper plains) makes it a convenient stop if travelling between Bangkok and Chiang Mai or to/from Burma via the Mae Sot crossing. In the late 13th century Sukhothai allied itself with Lanna, another ambitious Thai kingdom based further north, and expanded its realm across much of modern Thailand and Laos in a remarkably short period. Perhaps more importantly, it created a canvas on which a Thai cultural identity came into focus. For these reasons it’s often cited as the “first” Thai kingdom, though more isolated northern Thai kingdoms like Chiang Saen and Phayao did, in fact, come earlier. Reigning from 1279-98, Sukhothai’s most influential king, Ramkamhaeng, is now celebrated as a founding father of the Thai nation. He’s credited with inventing the Thai alphabet, facilitating the spread of Theravada Buddhism, developing an elaborate canal system and overseeing a great blossoming of the arts. He documented the kingdom’s progress via several stone inscriptions, including one from 1292 that ranks as the oldest known example of Thai writing. Ramkamhaeng was also a master of diplomacy: by 1300 the kingdom’s tributaries stretched from Luang Prabang to Nakhon Si Thammarat and beyond. Trade representatives exchanged Sukhothai’s signature Sangkhalok pottery for exotic riches from Yuan Dynasty China. Artists rifted on Thai, Mon, Khmer and Sri Lankan influences to forge some of the most graceful Buddha images ever seen, now classified under the Sukhothai style of art. Sukhothai left an extremely important mark on Thai culture and history, but its period of dominance was relatively short. After suffering an epidemic and briefly moving its capital to Phitsanulok in the 14th century, it came under the sway of a new rising star: Ayutthaya. What remained of the ancient capital sat largely neglected from the late 1500s to the 1950s, when restorations began. Home to around 50,000 people, the capital city of the same-named province is divided into two distinct districts: New Sukhothai (Muang Mai) and Old Sukhothai (Muang Gao). Cheap songthaews connect them via a 12-kilometre ride on Jarod Vithithong Road, or Highway 12. New Sukhothai is a medium-size city stretching on both sides of the north-to-south-flowing Yom River, forded by the Phra Ruang Bridge. Jarod Vithithong is the main drag running from east to west through town. 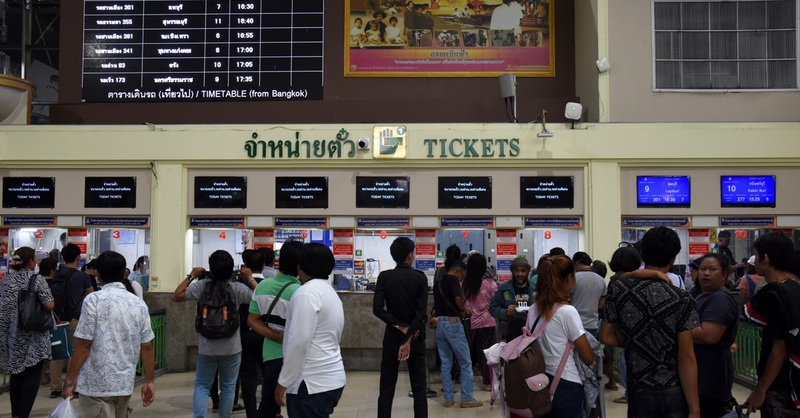 The bus station is located a few kilometres northwest of the bridge off Highway 101, which continues 55 kilometres north to Si Satchanalai and 80 kilometres southwest to Kamphaeng Phet. Highway 12 runs east out of town for 60 kilometres to Phitsanulok. Most of New Sukhothai’s guesthouses are found on the west side of the river while the city’s more local-style commercial area stretches to the east and hosts some good markets. Bank branches and ATMs are easy to find along Jarod Vithithong on both sides of the river. An internet shop is located next to a light-blue Krungthai Bank ATM on the north side of Jarod Vithithong, west of the river. You might wander down the riverside lanes to see life unfolding among the wood houses and temples, where New Sukhothai doesn’t feel very new. Clustered to the east of the historical park along Jarod Vithithong, Old Sukhothai is a much smaller and sleepier village with a row of guesthouses, traveller-oriented restaurants, internet shops, ATMs and two long-distance bus stops. Several newish places to stay have popped up along Napho-Khirimas Road, or Highway 1272, which shoots south off Jarod Vithithong, 1.5 kilometres east of the historical park. Old Sukhothai is developing quickly as more travellers opt to stay within easy walking or cycling distance of the ruins. Sukhothai Hospital stands alongside Jarod Vithithong, not far from a Big C shopping centre, a few kilometres west of New Sukhothai. The provincial police station is located around a kilometre south down Nikorn Kasem Road, which hugs the east bank of the river in New Sukhothai, and a smaller police station is situated just east of the historical park in Old Sukhothai. Tourist police offices are found at the bus station and along the road that skirts the northern side of the historical park’s central zone on the way to Wat Si Chum. Open from 08:30 to 16:30, a TAT office provides maps and brochures on the north side of Jarod Vithithong, less than a kilometre west of the river in New Sukhothai. Another tourist info centre is found off Highway 1113, just east of Wat Phra Phai Luang in the historical park’s northern zone. Please sign up as a Travelfish member to download the Sukhothai guide PDF (11.7 MB, 57 pages). Membership costs just A$35 per year (less than A$1 per week) and gives you access to over 250 PDF guides. Last updated on 15th June, 2016. Browse our independent reviews of places to stay in and around Sukhothai. Read up on where to eat on Sukhothai. Check out our listings of things to do in and around Sukhothai. Read up on how to get to Sukhothai, or book your transport online with 12Go Asia. Planning on riding a scooter in Sukhothai? Please read this.  Use the above map to find specific destinations in and around Sukhothai which are listed on Travelfish. Bed icons indicate a guesthouse, hostel or hotel, the knife and fork is an eatery or bar and the four-way circular thingy marks sights, attractions and other points of interest. Click on any icon for a short pop-up and a direct link to the page for that spot. If you are in the area, use the teardrop icon near the top left to show your position on the map (you'll need to allow position sharing for this last feature to work).